Fremantle Arts Centre’s annual program of intriguing cross-genre collaborations, Soft Soft Loud, returns in 2016 with a 20th anniversary performance of Mark-Anthony Turnage’s (UK) 1996 work Blood on the Floor, uniquely adapted for this occasion. Considered one of the most gifted composers of his generation, Turnage was inspired to write this piece after losing his brother to a drug overdose. This now-seminal work harnesses a powerful, high-octane meld of jazz and classical elements. The audience will experience a big sound as more than 25 musicians take to the stage. Jazz soloists unite with a hand-picked ensemble of dynamic WA musicians for this one-off collaboration, tackling Turnage’s complex yet lucid instrumental textures and artful union of notated and improvised material. The WAAPA Saxophone Department presents a showcase of eclecticism and vibrancy bringing together Classical, Jazz and World Music. Presented by the saxophone students and staff of WAAPA and featuring Basement Saxx, quartets and unforgettable solo performances, this night will leave the audience with no doubt of the versatility and musical power of the saxophone. Over three days PIAF brings you 18 events performed on a purpose-built stage inside the beautiful acoustic of Winthrop Hall and in the gardens outside. 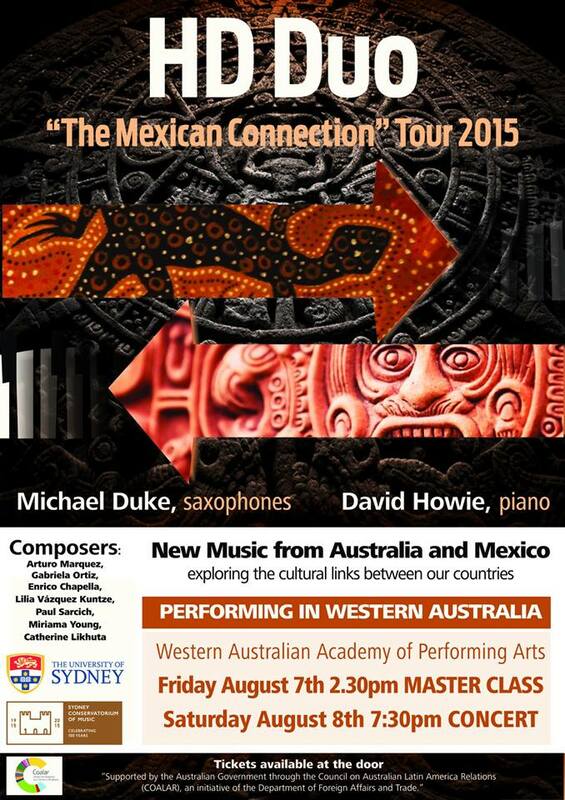 Michael Duke, Head of the saxophones at the Sydney Conservatorium and one of Australia’s premiere sax players gives a FREE recital with brilliant pianist David Howie. Michael will also be conducting a master class with the WAAPA Saxophone Studio at 2:30pm on Friday 7 August, in the WAAPA Music Auditorium. Honours year recitals at School of Music, UWA. Public recitals – free admission. Wednesday 19th November at Callaway Auditorium & Eileen Joyce Studio, School of Music UWA. Program – Trio for clarinet, cello & piano – Brahms, Fantasiestucke for clarinet & piano – Schumann, 3 Miniatures for clarinet & piano – Penderecki. Michael Collins joins the WA Symphony Orchestra for Mozart’s Clarinet Concerto, one of the most popular works in the orchestral repertoire and voted No.4 in the ABC Classic 100 10 Years On. The astounding artistry of British clarinettist Michael Collins will reveal all the eloquence and sublime beauty of Mozart’s much-loved concerto. WASO celebrates the 60th birthday of acclaimed Australian composer Carl Vine with the World Premiere of his Concerto for Orchestra. To complete the program, Michael Stern unleashes WASO’s virtuosity and brilliance in Rachmaninov’s intoxicating Symphonic Dances.